I hate Thanksgiving. I hate most holidays. I like Halloween so much I got married on it. I treat my kids’ birthdays like they’re holidays. I’m not a total killjoy. I have so many problems with Thanksgiving in particular. The historical roots make it rather unappetizing. It’s hard to enjoy eating when you’re thinking about genocide. And giving thanks on just ONE day? I am not about that either. Every day, folx. Despite all these feelings, I end up doing the Thanksgiving thing anyway and somehow I manage to not be a Debbie Downer to everyone around me. It might be that I approach the day looking at it as just another day I’m feeding my family and having gratitude. That’s how I get through the day without snarking about how the cranberry sauce reminds me of the blood of slaughtered Native-Americans (not to say I have never made that observation out loud. In retrospect, I was an obnoxious teenager). In short, I’m all growed up now and try not to ruin other people’s special day even if I think it’s a stupid day. I am even the one that cooks the damn food for everyone. This year had the extra challenge of a budget tighter than W illie Nelson’s headband. We only had 8 to feed this year , so this was somewhat helpful. The average Turkey Day din-din costs around $50. This does not include anything I already had on hand – salt,herbs,onions,garlic,sugar,flour,etc. If I wasn’t a pantry staples hoarder and herb gardener, my total would have been a lot higher. I know that these things when used in a meal work out to be cents but buying all those ingredients at once would be a no-go for most low income people. My eldest son made the dressing. He bought some of the ingredients himself but a good deal came from the food pantry he volunteers at several times a week. The bread (a mix of rye,sourdough, and cornbread), celery,apples,fresh rosemary,thyme,and oregano were all from the food pantry. My mother bought 3 pies, all made by the Methodist Ladies group. The proceeds go to their spring mission trip which is usually to go to another country to help build a school or something else awesome and helpful. Turkey, mashed taters, roasted glazed carrots,green bean casserole, homemade dinner rolls,fresh cranberry sauce,dressing. 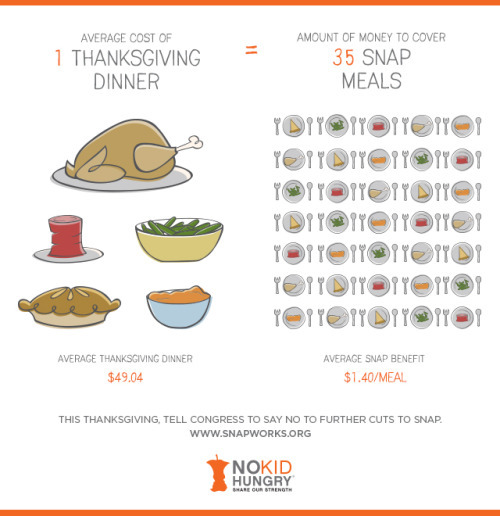 The math works out to be $3-ish per person, which is more like an entire day’s SNAP budget. Definitely not a minimum wage without SNAP meal,either. The huge plus side is that I have a cubic buttload of leftovers that will stretch over the days?a week? into other meals. Otherwise, I could not even justify spending that much on one dinner. I’ll do a leftovers post next week with all the meals I managed to get out of this one shindig. Despite all my Negative Nellie feelings about Thanksgiving, I still wish everyone could have the food filled celebration they want instead of standing in line at a food kitchen dinner or eating boxed mac and cheese from the food bank. These holidays that are centered around food are awful for poor folks. I’m so grateful there are people out there who have enough to share and willing to share it. Next Next post: SNAP News: Maine aiming for more restrictions, Georgia tries to deny refugees SNAP, and more….